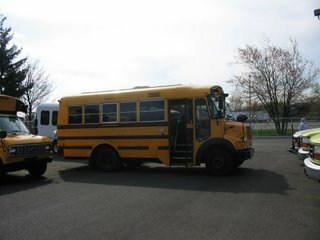 Wednesday I had the opportunity to go to Fife, Washington where they have a bus sales lot. We didn't see anything potential at the lot, but there was a park-n-sell down the road that had something that pretty much fits the description of what we're looking for. It's a 1996, 24 passenger Thomas school bus. Next week I'm going to be doing some more research as far as what's out there, because the price for this bus was over $10,000. Our budget right now, I believe, is $0...that would be a gift :). Anyway, I'm posting a picture of an idea of what we're looking for so you can be praying and looking yourselves as well. We would sure appreciate any kind of help.